A bit of a clumsy name for a sport, I'll readily admit. Mountain boarding? Also known as 'all-terrain boarding', or perhaps 'grass boarding'. Or pretty much anything you like, noone's heard of it so you'll have to explain what you mean anyway. So what is it? 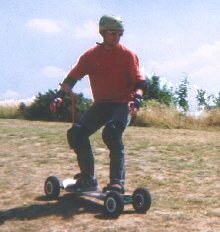 Well, imagine a skateboard, but made longer, and instead of having small plastic wheels mounted underneath, put a springy metal chassis underneath to support big metal tyred wheels at each corner. OK? Right, now put footstraps on it, find a grassy hill, and launch yourself down the fall line. But I recommend you get some elbow / knee / wrist / head protection first, because this is going to hurt. It was Summer99, and myself and Foxy Andy were pining for the snows. So in search of that elusive 'board-riding' feeling, when we heard of this new-fangled All- terrain boarding thing, we just had to give it a whirl. There aren't many places that have heard of it, but we found one at Stubbers Adventure Centre (see links later), in Essex, UK. Thankfully, all the protection kit was provided for us, and after strapping ourselves in, we got a run-through of the basics of board control. I was hoping that it would be fairly similar to snowboarding, to give us a fighting chance, but although the ideas were the same, the response from the board was much different - very immediate and very direct. And you can't brake in the same way, you can't just dig in the edge to scrape off a bit of speed, because the wheels don't grip in the same way. This board wants to run. 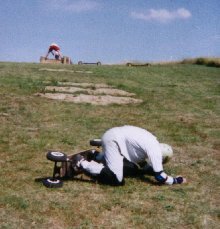 Lesson number 1 - If you do try and dig the edge in to slow down, the board will carry on going and leave you leaning backwards - not a good thing. Overcook it and the wheels let go of the earth and introduce it to you instead. The centre we used had two kinds of board, a beginners' board (supposedly easier to control) and a more responsive type. 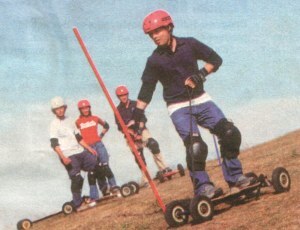 The beginners' board didn't have footstraps, so that you can jump off at the vital moment, but it therefore needs a handheld leash so it doesn't race off without you. It's personal preference whether you like being able to jump off or not, but I myself felt more precarious when I couldn't use the straps to push the board (like on snow). Lesson number 2 - Try to do anything fancy without footstraps and you'll soon know about it. First of all we tackled a couple of gentle runs down the short slope, trying in turn to make smooth left or right turns (with variable success). Fortunately there was a convenient runoff field of long grass at the bottom! Next up was the slalom challenge, but two or three poles were about as many as we could manage! Getting the hang of it slowly though. Lesson number 3 - Bend the knees! Keep your weight forward! Turn with your upper body! Same rules as on snow, but these suckers are a lot less forgiving. "Enough of this tame slope", we eventually cried. "What did you say about a terrain park?" So we raced over to the other side of the slope, where we eagerly anticipated their jumps, bumps and banks. Sadly, when we were there, the recently-created terrain hadn't really had chance to settle in, and was therefore extremely bumpy and uneven. With any luck they've improved it since then, and hopefully enlarged the banks to give you a proper chance of riding them. To further our disappointment, the sun had baked it all into a rock-hard bumpy mess, but like I said it was in its early days then and that was a long time ago. Lesson number 4 - You've got to watch those little advanced boards when they start a-twitchin'. They've got such a small turning circle that by the time they've sprung a little to the left, all of a sudden you're leaning to the right, making it turn that way a little bit faster. 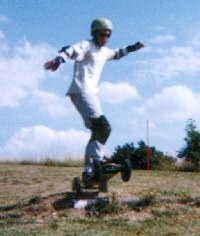 Before you know it, you're doing the bendy-leg dance, with the board doing a frantic slalom underneath you. And you know that can't last for long. So after the terrain park, there was only one thing left to try. "Got any jumps, mister? ", we asked. And sure enough, there was one. Quite small, but big enough for us. Looks like nothing on the photos, but anything big enough to get all four wheels off terra firma is going to put your landing skills to the test. Especially on the twitchy board. (I didn't try jumping on the footstrapless beginners board, but I guess for skateboarders that may be more natural?). Well OK, just a few. Just to give you an idea. OK, you have to stretch your imagination to call this shot 'jumping', but I promise all four wheels did get off the ground. This sport is so cool, even Ant and Dec and Cat Deeley had a go! (Sadly not while we were there). 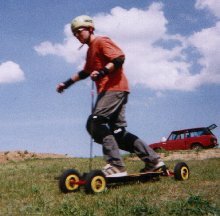 MountainBoard.com - Some superb pics and movies to give you a better idea, and even location recommendations! Page last updated April 2002. Feedback welcome at mail@activityworkshop.net.